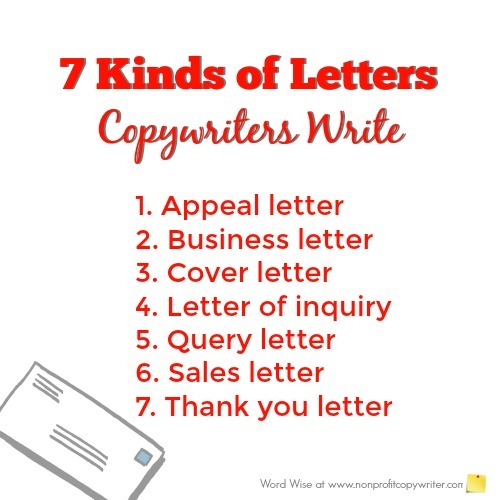 Copywriters write dozens of kinds of letters. They are a part of daily life, both in your personal communication and your professional communication. Different types of letters have different purposes. One size does not fit all. When you know the purpose of your letter you can construct it accordingly. Use this glossary to understand the different types of letters that copywriters most commonly write. A form of sales letter (see #6), the appeal letter is written to persuade the reader to give a financial gift to a worthy cause. A business letter is a broad term for many kinds of correspondence used in conducting business. It is sent from one party to another – whether from a company, organization, customer, or individual – to another. The content may vary, ranging from requesting information, providing information, requesting action, making an announcement, placing an order, offering or terminating employment, confirming a sale or agreement, lodging a complaint, or offering an apology. The style of letter varies, depending on its purpose, the sender, and the recipient. A cover letter accompanies other documents - resume, application, or information packet - serving as an introduction. A letter of inquiry or letter of intent (LOI) is regularly requested by foundations or government agencies prior to submitting a complete grant application. The LOI provides an overview of the complete grant application, allowing you outline the potential project, cost estimates, and projected outcome. A query letter is a proposal, sent to a publisher, agent, or editor from a writer, suggesting a potential writing project. Of the various kinds of letters, thank letter is often shorter than others. Its sole purpose is to express gratitude to the reader (whether an individual, organization, or company). Thank you letters can be formal as when printed on letterhead or informal when handwritten on a note card.